It’s easy to forget that at the time, we were tied to the handset by a spiral cord that always got twisted, and it wasn’t uncommon for there to only be one phone in the house. For a time, my family had a “party line” which meant we shared a phone number with another family. Shocking, eh? 40 years makes a difference. For laughs, someone has gone to the trouble of mimicking the communicators for the iPhone. Spiffy, eh? If that doesn’t work for you, try the Bluetooth Communicator for a few extra pizazz points. 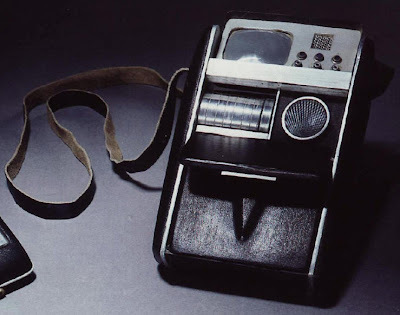 Well, how about the Tricorder, the gizmo that “Bones” McCoy used to detect health signs? Or that Spock used to detect life form readings or elemental composition? Well, we’re not quite there. Yet. But progress is being made, including using handheld ultrasound devices to test for foodborne pathogens and, with high intensity ultrasound, to wounds. Cool stuff. The units are not entirely remote, but Vscan is a darned interesting product, which you can see if you have patience to watch the videos. I think to some degree we’d all like a device to wave over our bodies and tell us what isn’t working, or, and perhaps more encouragingly, everything that’s working well. Especially if it can done quickly, without a doctor’s appointment, and without accompanying copays or 3rd party rationing. We’ll see. Research continues on other Star Trek “technologies” as well. So, which would a 21st century technophile choose first? Nanotech enabled cloaking, painless injections (hyposprays), transparent armor (deflector shields), or a Type II phaser sold at your local Wal-Mart? Hmm. I saw a documentary on the science of Star Trek, hosted by senior officials at NASA (apparently, a big group of fans). They stated that, of all the sci-fi concepts, equipment, and products, the only one with absolutely no basis in reality was the Phaser. They said it was completely impossible to come up with a plausible theory for how a weapon could Stun at one setting and Kill at another. Every other item from Star Trek, from warp core engines to transporters, have at least SOME basis in fact! Cool stuff! I remember the party line as well. I guess part of what is not said is that in the 60s, we all thought we would be riding in style ala "The Jetsons." Technology was marching fast and there was no reason to believe we would not continue the pace. The iPad is definitely a nod to that!